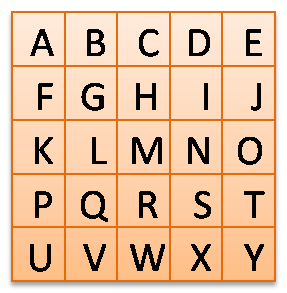 By following the instructions in the puzzle page (PDF link below) and through logical deduction, find the correct placement of the first 25 letters of the alphabet in the table (5X5). For example, if you read: “A is in a corner”, you would have to put the letter A in one of the four (4) corners. But which one…? Well, if you later read: “F is immediately below A”, you will deduct that A is in one of the two top corners. Right!? Then, if you read: “E is to the right of A”, you will know that A is actually in the top/left corner. Some will be easier than others.